Because of these injuries, he had to dispense with a start at the Isle of Man TT. By a technical problem at the Honda Fireblade McGuinness rushed at about 160 km / h and flew over a 3 meter high fence to a golf course. In addition to the vertebrae and broken ribs he pulled up a open fracture on his right leg. A skin transplant was necessary and 5 cm was missing of the bone. The external fixator allows the bone to heal again, but at the same time it must also be stretched, since the missing material must regrow slowly. A very lengthy and painful procedure. Until the material has grown correspondingly, one counted with a time span of 8 months. But even after this time, the leg will remain restricted in terms of strength and agility. 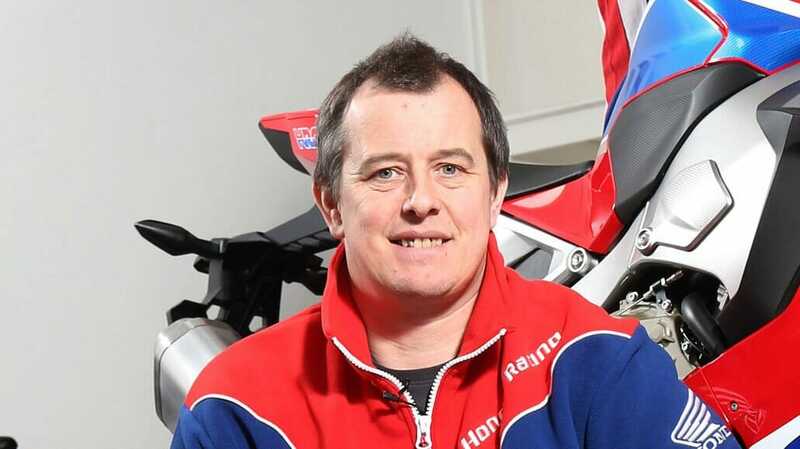 In an interview with bike Social John McGuinness talks about the possibility of not being able to compete with a Superbike at the TT. Driving a Superbike is just extremely exhausting and he does not know if it will be possible in the future. In addition, he would miss a lot of the training and preparations for the TT, because of his injury. He would not be competitive at the TT 2018. He does not want to announce his career end yet, and later he will start racing again. After all, racing drivers are a bit crazy, and as soon as they get better after an accident, they also get back on their motorcycles. Classic races might be a way – a good compromise. Accurate will then only show the time. DAVE KNEEN/PACEMAKER PRESS, BELFAST: 04/06/2016: John McGuinness (Honda – Honda Racing) at Ballaugh Bridge during the RST Superbike TT race.